This morning the news anchor reported that it would be a whopping 100 degrees F. I don't know about you - but that's F'n HOT! I decided to stay inside and experiment with a few of my favorite DIY beauty fixes. 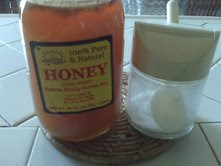 Combine a 1/2 teaspoon of honey with 1/2 a teaspoon of sugar and form into a paste. What are some of your favorite lip treatments? I'm in the market for some so I would love some suggestions ? ?